Juice bar and cafe on London Road. It opened in August 2017. It was previously a hairdressers and barber shop: Suave on the ground floor photo and Precision Barbers in the basement. 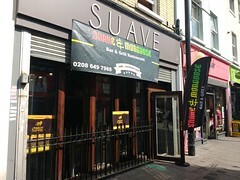 Suave was previously known as Suave Living photo, but changed to Suave after it got a new Connected Croydon shopfront in 2015. Suave closed down some time in 2016 or 2017. Existence last checked in September 2017. Last edited 2018-11-27 13:52:12 (version 46; diff). List all versions. Page last edited 2018-11-27 13:52:12 (version 46).